As a kid, I remember being so excited to celebrate my birthday each year. I mean, who doesn’t love getting gifts, eating too much cake and ice cream, and spending time with people you love? As a kid, if someone asked me, “How old are you?” I would proudly tell them my age. Sometimes, I might even correct them – “No, I’m not 7. I’m 7 1/2.” Adults, though, don’t seem to proudly announce their age, and they rarely brag about their “half-birthdays.” Why is this? Why is it that when we are kids we can’t wait to be older, but the older we get the more we think about being young again? Maybe it’s because we yearn to go back to the days when things were simpler….the days when our biggest concerns were what to play with next…the days when others took care of us and the world seemed safe… the days when our hearts didn’t know what it felt like to be broken….the days when dreaming was encouraged and anything seemed possible. For me, it took losing my mom to gain a new perspective about life. That first year was the hardest, especially the holidays. I had lost loved ones before, but something about this was completely different. I remember feeling like a piece of me was missing and wondering if things would get better. I remember the smallest things would trigger me and stir up emotion – hearing a certain song on the radio, seeing the color red (my mom’s favorite color), or even walking down the card aisle of a store was difficult. I also remember being surprised at how difficult it was to celebrate that first birthday after losing my mom. I didn’t feel like celebrating the day I was born when the person who gave birth to me was no longer there. I just wanted to get through the day. Years later, I still miss my mom every day, but the sadness is no longer overwhelming. Laughter, joy, and hope have returned. The Journey class, the book, Motherless Daughters by Hope Edelman, and connecting with others who have experienced mother loss have all been instrumental in helping me along this grief journey. It’s a journey that I’m still on. Losing my mom taught me that we shouldn’t wait for birthdays to celebrate life. Tomorrow is not guaranteed. Psalm 139:16 says, “Your eyes saw my unformed body. All the days ordained for me were written in your book before one of them came to be.” God knows the number of our days, and that means each day we are alive He has a purpose for us. Each day we can choose to celebrate the fact that we exist for a reason. It doesn’t mean we won’t have struggles. It means we can have hope because we know there is purpose in those struggles. Each day we can choose to celebrate the fact that we are given more time to connect with those around us…to share our story and become a part of another person’s story. Each day we can choose to celebrate the fact that we have the opportunity to show love to others…to let them know they are valued and that their lives also matter. Celebration is a choice. 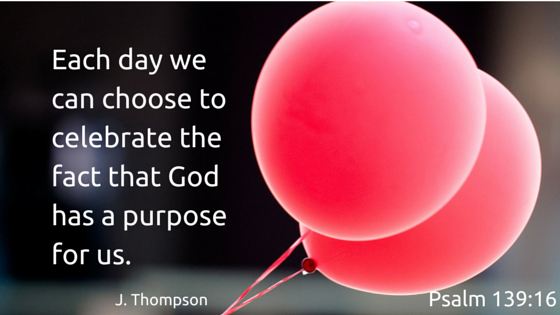 What will you choose to celebrate? Another birthday is approaching. While my mom will not be there in person, I choose to celebrate the fact that the One who gave me life still has a purpose for mine. I really love to read your blogs, Julie! You are willing to be so “real” and share your heart! At age 74, I have reached the age where I am more grateful for the new number–knowing that each day is a gift–and the next day is not guaranteed! I am SHOCKED that I could possibly be this old–but grateful for each new year! Your shared wisdom is a true gift you share with the rest of us! Thank you! I needed this today. Thanks Julie. Julie, I really enjoyed your meaningful commits about your life! Your Mother was a very special & wonderful friend to me. Our age is a real blessing! It is a loving gift from God. It is very important how we live each day. I am 69 years young & I am very thankful for my good health. I wish you a very Happy 33rd Birthday tomorrow! I know your Dad will enjoy his special 70th Birthday this week too! With Love, Joanne PS I miss your dear Mother too. I also miss my dear Mother! Hugs!